M.D. Muthukumaraswamy is a Tamil writer, Director of National Folklore Support Centre, Chennai, and an Expert Consultant with Sahapedia. He is the author of the column 'Lore and Life'. In the cluster of festivals and rituals around the equinox worldwide, India’s share is plentiful, and Holi would be primary. It appears that for thousands of years, civilisations around the world have recognised the arrival of spring and the change of season in the third week of March after the full-moon day, and the arrival of equinox—when day and night are almost equal in length across the world. This is because the sun is positioned above the equator during the equinoxes, and world civilisations marked the day as the day of new beginnings. The Persian New Year, Nowruz, starts on this day; early Egyptians built the Great Sphinx in such a way that it points directly towards the rising sun on the equinox; and many sects of Christianity consider Easter as the New Year that usually falls on the first Sunday after the March full moon. Ancient and medieval Indian literature refers to the festivals of this season appropriately as Vasantotsava (celebrations of spring) and describe them at great length since they were major events of their times. The spring festival is called Yatramahotsava of Madana in the Sringaram Harikatha, the Kamamahotsava in the Kavyaviveka, the festival of Madana in the Ratnavali and Bhavishya Purana, and Madanotsava in Bhavaprakasha. As names such as 'Kama' and 'Madana' indicate the arrival of spring, the festival is perceived and equated with the heightening of love and lust in humans, and fertility and regeneration in the vegetation and animals. Anthropologists have often identified spring festivals as fertility rites and Holi is a prominent example. Wild behaviour, a liminal period of breakdown in social hierarchies, and definite overtones of sexuality and intoxication characterise fertility rites and festivals, and the behaviour of Holi celebrants has enacting references to at least two interlocking mythologies among many. As Kamamahotsava, Holi is believed to be the day Lord Shiva opened his third eye and burned down Manmata—the god of love—into ashes. The Kamamahotsava used to be celebrated in Tamil Nadu on the fifth day after Pongal with explicit references to the Shiva mythology. Lavani was a Tamil folk performance in which participants would divide themselves into two opposing parties that sing, dance and debate endlessly whether the god of love can be burnt down or not. Now these celebrations and the form of Lavani have become extinct in Tamil Nadu, but their north Indian counterparts exist vibrantly as part of Holi celebrations. Setting up of a huge bonfire on the night of the full moon to mark the beginning of Holi celebrations in the villages of Uttar Pradesh and Bihar refers to the act of Shiva burning down the god of love. However, as mythologies cross-fertilise and envelop ritual acts, the bonfire has other references as well. 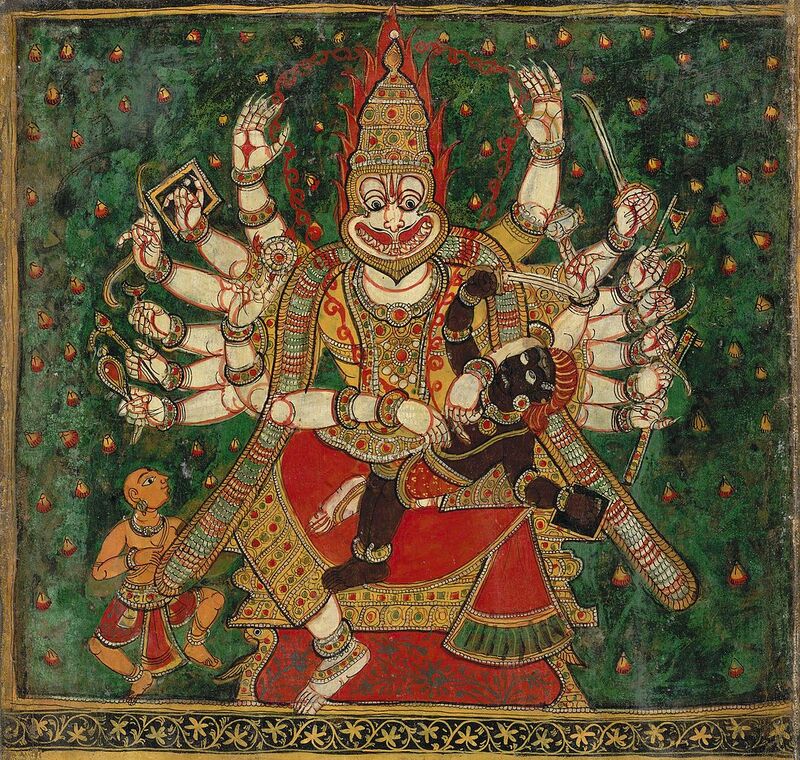 In the mythology of Narasimha (Vishnu’s avatar), Holika, the sister of Hiranyakashipu, took Prahlada on her lap and sat on a pyre to save him and the devotees of Vishnu were unharmed. Many anthropologists report that Holika was the saviour of Prahlada and a devotee of Vishnu, and the festival is named and celebrated to honour her. 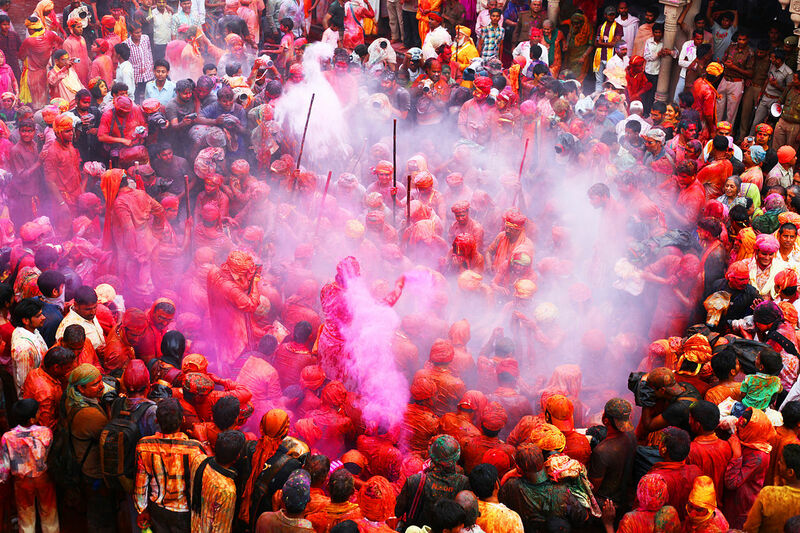 However, the contrary version about Holika is popular among the participants of Holi. According this version, as Prahlad was not hurt by all the attempts on his life, Hiranyakashipu called upon his sister Holika, who had a boon from Lord Brahma that she could not be burnt by fire. Holika made Prahlad sit on her lap in the fire, with the intention that he would burn to death. But the scheme failed, and Holika was burnt to death and Prahlad was unhurt. In the cultural region of Braj, where epicentres of Holi such as Mathura and Vrindavan are located, the festival has come to be associated with the divine love of Radha and Krishna. The women of Kishan Garhi identifying themselves with Radha to feel the empowerment of role reversals during the festival time is not restricted to that village alone, but is an all-pervasive phenomenon of Holi. The diverse ways in which Holi is celebrated across north-western Indian states share these role reversals and the centrality of women as the core of their celebratory activities. Holi is also a merchandise to be sold to the traditional participants living outside the inherited contexts of its celebrations. While the history of throwing and smearing coloured powders and sprinkling water on everyone you meet is not yet fully known, it is marketed as a fun ticketed activity inside the theme parks of new urban areas in the South Indian cities. Some of the marketers of Holi even invoke the mythology of the ogress Dhundhi—who could be frightened away by the taunts of children—to entice the children to hoot, shout and have fun in celebrating Holi. Participatory and diverse, the charm of Holi celebrations continues to be the possibility of throwing colourwd powders in the faces of authority figures and establishing a temporary egalitarian utopia. [i] Marriott McKim, ‘The Feast of Love’, in Krishna, Myths, Rites and Attitudes, ed. Milton Singer. Honolulu: East-West Centre, 1966, 210–12. [ii] Sanjay Tiwari, ‘An Unholy Festival’, Economic & Political Weekly, XLVIII, no. 21 (2013). [iii] A. Whitney Sanford, ‘Holi Through Dauji’s Eyes’, in Alternative Krishnas: Regional and Vernacular Variations on a Hindu Deity, ed. Guy L. Beck. New York: SUNY Press, 2006. [iv] Nandini Gooptu, The Politics of the Urban Poor in Early Twentieth Century India. Cambridge: Cambridge University Press, 2001.